Mr. Johnnie Charles “Bo” Lindsay answered the call of God November 17, 2018 to come home after several months of illness. Born in Lexington County on September 20, 1934, he was the son of the late Jack Albert and Roberta Lindsay. Bo graduated from Twin City High School. After graduation, he enlisted in the U.S. Army and served many years. He was a great family man who loved his family, getting them together at any time, date, day or place. 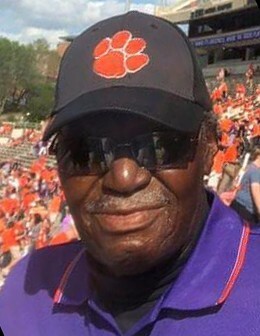 He loved the Lord and also was a lover of all sports. He was a very supportive person for the church, youth programs and sports. Mr. Lindsay joined Friendship Missionary Baptist Church at an early age. Later in life, he became a member of Saint Mark Missionary Baptist Church. Bo was preceded in death by his parents, a loving wife, Juanita Lindsay; a daughter, Delsene Williams; a son, Johnnie Etheredge; a God-son, Larry Matthews; two granddaughters, Chasity and Charice. Bo leaves to cherish his memories: daughter – Debra (Jessie) Johnson; sons – Kelvin Lindsay, Clayton Lindsay, Clifton (Angela) Lindsay, Maurice (Timeshia) Lindsay and Cornelius (MiaConti) Lindsay; two granddaughters raised in the home – Shakira Lindsay and LaWanda Inenetu; two brothers-in-law – George (Hazel) Langford and Anthony (Lela) Langford; one devoted brother – Louis Holloway; daughters-in-law – Brenda Lindsay and Julia Etheredge; God-daughters – Shirley (Danny) Wise, Barbara “B.J.” (Keith) Landy and Dale Matthews; God-sons – Rodney Gantt and Stelphonza Wise; God-brother – James Johnson and Willie (Evanise) Johnson; twenty-seven grandchildren and twenty-eight great-grandchildren; his little caregiver and bodyguard – Princess Johnson; a host of nieces, nephews, cousins and many sorrowing friends and neighbors who will miss him dearly.